Ok I just like to invite you all my readers and visitors to visit my New Personal Blog “ Dexter Panganiban’s Site “ topic will be about anything, It depends on my mood, That site will not be a niche blog. So you are free to visit and comment, Your feedback is welcome. You may subscribe thru my feeds or via email as you wish. Hope you like and enjoy visiting My new Personal Blog. Congrats sa new blog brother! Ilan na ba silang lahat? Enge naman jan hehe. Dexters last blog post..Migrating from Free Platform to Paid Hosting – Technicalities ? Congrats! Will surely visit this. Visiting now . 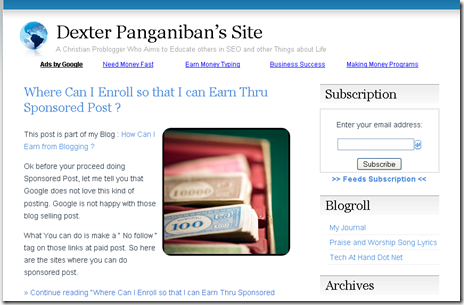 . .
Dexter | Tech At Hand Dot Nets last blog post..Did You Know That Friendster Could Help You Promote Your Blog ?